I went back to the school the next week for my private class with Louise Dawson, a lovely young woman with a certificate from the Royal School. We set it up for the afternoon, so I got to spend the morning with the other stitchers. More coffee, more cake! I asked them if they had cake every week and they said no, but we managed cake both times I was there! Louise got everything set up for my class while I gobbled a sandwich I’d brought with me, and we got started shortly after lunch. 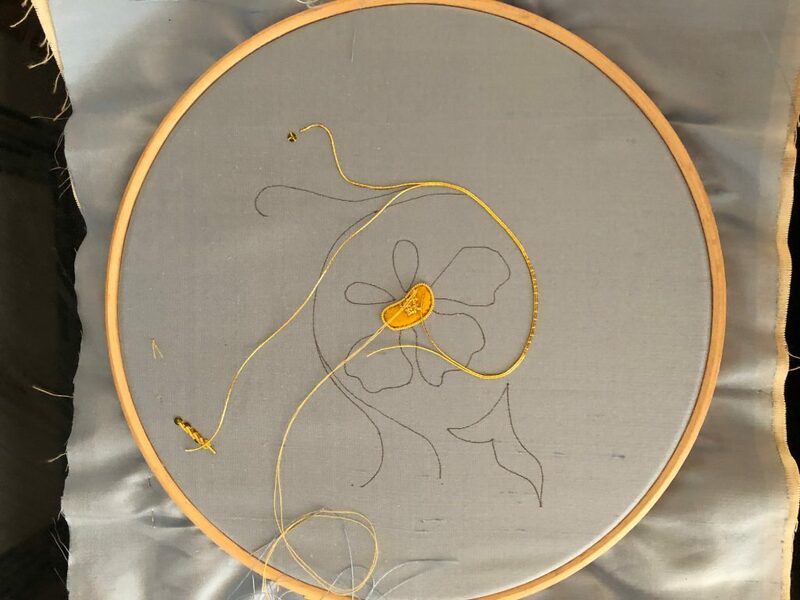 I selected a small goldwork project, and Louise transferred the pattern to a lovely light blue silk, mounted the silk and backing fabric in a hoop, and I was ready to begin. I’ve taken several goldwork classes before, but I always learn something new with every class I take. I learned how to secure my stitches with a pin stitch, a little differently than pin stitches on canvas. We started with chipped gold for the center of a little flower, then moved on from there. For such a small project, there were a lot of different threads and techniques involved. Louise got everything assembled for me, since I wouldn’t have time to finish, and we went over everything so I could complete the project on my own when I got home. Everything was beautifully packaged in these little envelopes, so I could easily see what everything was. 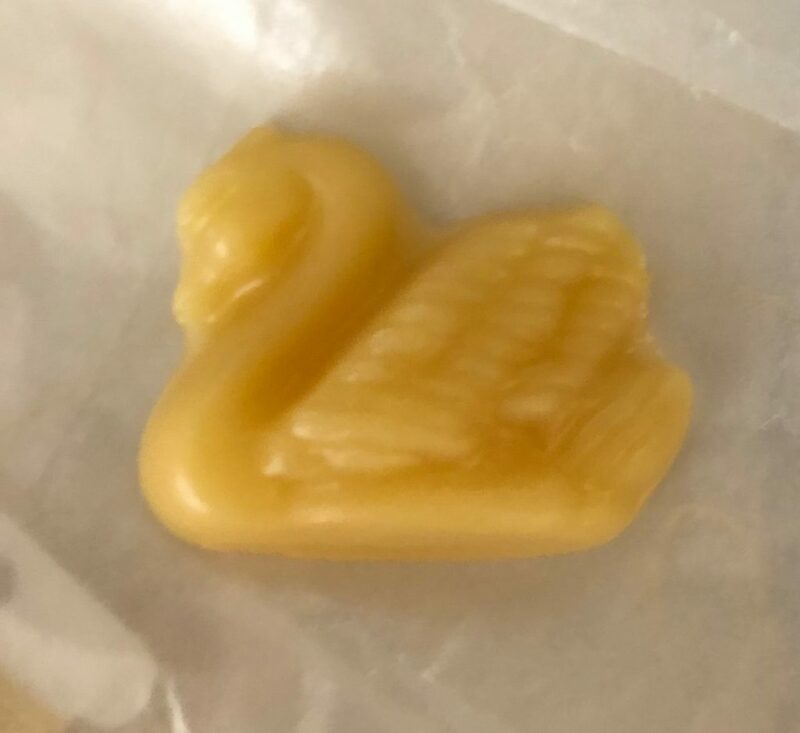 Louise even gave me a lovely beeswax swan! The logo for the Wemyss School of Needlework features a swan. I don’t know if this is included with every class project, but I was so happy to have it! I learned several different things, including stitches and techniques I can apply to my design work, even without using gold. But I love this little project and hopefully will get it finished before too long, and can share the finished picture with you. 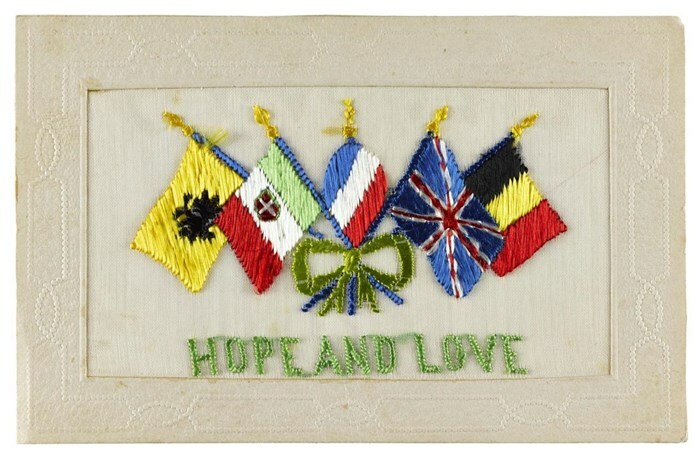 The Wemyss School has an extensive collection of stitched work. Not everything is on display because there isn’t room. But they serve as a repository for stitched pieces. Both Wednesdays while I was there, people brought in stitched work of all kinds that they found in attics and storage chests, and the Wemyss School takes it and saves it. Not everything is wonderful and awe-inspiring, but quite a few pieces were and I enjoyed being able to look at these lovely old stitched pieces. The school is out of the way, but so well-worth the time to visit. With the public bus system it was very easy to get there, at a time when I wanted to visit, and easy to get back. The next time we visit Edinburgh you can be sure that I will return! I saved the best of my trip to Scotland for last, and it will probably take a couple of posts to get it all out! When I knew I was going to Scotland (with husband for his work), I immediately began searching for needlework, and the Wemyss School of Needlework came up. On the map it looked a lot closer to Edinburgh! In actuality it was about 1 1/2 hours away by bus. But I decided I had to try to get there. I called the school to see if I could set up a private class with one of the tutors, since they had no classes scheduled for when I was there. And, I confirmed that Wednesdays were “free stitching” days – everyone brings their projects and stitches together. If nothing else, I could do that. So I did some investigating for how to get there, and discovered that a bus left from right in front of my hotel and stopped right in front of the school. Problem solved! I set up a private class for the first Wednesday I was in Scotland. I didn’t care which technique, I just wanted to go to the school and do anything! So I headed out on Wednesday morning, bought a day ticket to Wemyss, and settled in to enjoy the beautiful countryside as I left Edinburgh. The bus driver was quite helpful; he pointed out that a day ticket was the least expensive option, and saved me a few pounds! The bus headed over the Firth of Forth with its beautiful bridges and into the Scottish countryside. Wemyss is a very small town. And one of the first things I learned was that I was pronouncing it wrong. My husband and I were at dinner one night (Mexican restaurant in Edinburgh!) and one of his co-workers in the Edinburgh office just happened to sit at the table next to us. We started chatting, and discovered that she was actually from the area, and was able to correct my pronunciation so I didn’t embarrass myself too badly at the school! Just so you know, it’s pronounced “Weems”, and I was adding an extra syllable, saying “Weemus”. Glad we got that sorted out! The school is in a very old building, on the grounds of the Wemyss Castle. The school was inspired by the Royal School of Needlework in London, but with the aim of teaching an employable skill to the local girls so they could earn a living. The current headmistress of the school is Fiona Wemyss, carrying on the tradition of the school. Inside the school several samplers and other examples of stitching are on display. I was fascinated by a beaded wedding gown on a mannequin – so tiny! 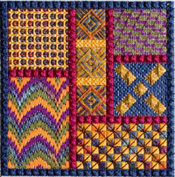 It’s worth a visit just to see the examples of stitching on display. So I arrived shortly after 10 a.m., stitching supplies in hand, and met two of the volunteers, Linda and Fiona. We were soon joined by several local stitchers who had brought their projects to stitch, and after a little coffee or tea we got to work. The stitching room is very nicely appointed, a huge table covered in green wool, with stitching lamps at every chair and several Lowry stands available for use. I also met Sheila, one of the team members. Sheila was celebrating her birthday, and one of the local stitchers brought cakes to share! So after stitching a bit longer, we broke to enjoy cake and coffee or tea again. It’s pretty much like stitching with my local group, lots of laughter and chatter, sharing of projects and hints, just fun. It turns out my email confirming my private class was never received, so I had to plan to return the next week. Oh darn! Rats! I had to go to the school twice while I was in Scotland. Horrible! Of course I hope you realize I’m being facetious! It was wonderful, and I could have happily spent several days in Wemyss with the lovely stitchers I met there. More about the class in the next post! Those of you who know me know that I’m not really a fan of samplers. I don’t stitch them, don’t design them and don’t have any at my house. But I made time to visit the exhibit of Scottish samplers at the National Museum, and it was very illuminating. The Scottish samplers are on loan from an American collector, Leslie B. Durst. She has a vast collection, and 70 of them are on display at the museum’s exhibit of Embroidered Stories. The exhibit was a little hard to find, since I was finding it challenging to interpret the map of the museum’s lay out, but I finally found it. The exhibit includes a video, which I did not take the time to watch, and several examples of Scottish samplers stitched by girls AND boys! One of the samplers I found most fascinating was a sewing sampler. 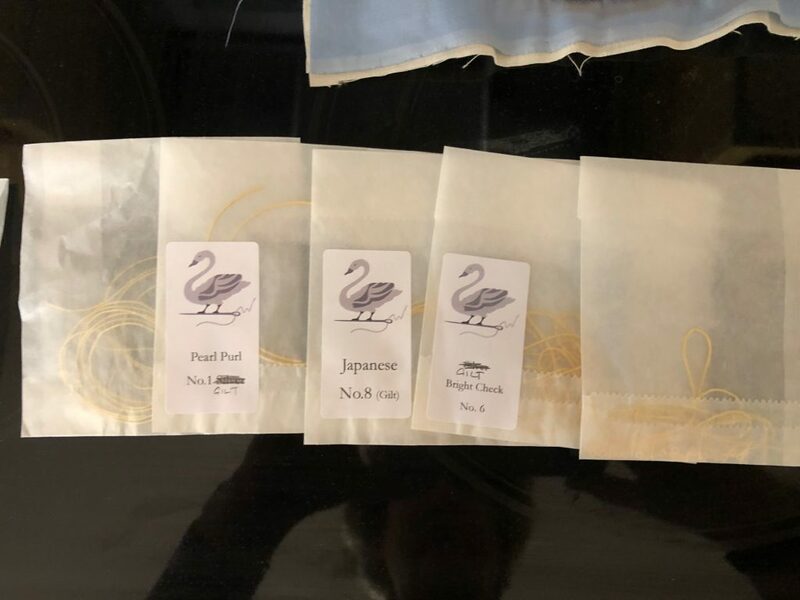 It showed several step by step lessons in sewing skills – sewing a straight seam, joining two pieces of fabric (faggotting), a buttonhole, tucks, basting, even a button! The button was especially intriguing because buttons were expensive, so to know how to make one by hand was a useful skill. The sampler was used to display a seamstress’s expertise in various techniques, and to help her get a job in hand sewing. I spent a long time in front of that sampler! Another display showed two samplers framed in glass so you could see the front and the back. One of them was quite meticulous, and it was very difficult to tell the front from the back. The other one not so much, and it looked more like my stitching with some pretty long thread carries! The samplers displayed various techniques and colors, and if you’re a fan of historic samplers you’d love this exhibit. I was able to get quite close to examine the stitching, and I thoroughly enjoyed that. My Edinburgh friends, Jonathan and Jane Beth Brown, met me for lunch at the museum. Those of you who are ANG members will know them from seminars. We had a delightful lunch discussing stitching, ANG, Edinburgh and all manner of things. I learned from Jane Beth that the society that tends to St. Margaret’s Chapel at Edinburgh Castle is exclusively women named Margaret! You have to be a Margaret to belong. And Jonathan shared more stitching kinds of things in the area, including The Dovecot. I didn’t have a chance to visit The Dovecot but will do it another time. It is a repurposed swimming pool, with weaving set up in the former pool area and viewing from the balconies above! Next visit! We took one weekend to go to Stirling Castle. Again, lots of walking! We took the train from Edinburgh to Stirling, and everything we saw online indicated that we would have to walk up to the castle. That turned out not to be entirely true, but we didn’t discover that until we had walked straight up (it seemed like it was straight up!) to the castle. Then it was more up and down and all around the castle, but let me tell you what we saw! One of the first things I saw was a sign to the tapestry exhibit! So of course we had to do that! The tapestry studio exhibit was at the very far end of the castle grounds, and we didn’t see it until we had gone through the castle with a guide. So after seeing the tapestry studio exhibit we had to go back to the castle to see the tapestries we learned about – more up and down. Let me tell you, everything in Scotland is hilly! The tapestries hang in the queen’s bedchamber, and tell the story of the unicorn hunt. This is a classic them in medieval tapestry, and the tapestries covered the walls of the queen’s bedchamber, both for warmth and decoration. The link goes to a video about how the tapestries were woven, not very long, but very interesting! The studio exhibit was fascinating because it tells the story of the recreation of the tapestries. It includes a short video about the tapestries, but it also had several of the threads, bobbins, a tapestry in progress, and other items. I even saw a DMC thread wrapper! It’s always fun to find things in an exhibit that I recognize immediately. After we had walked to the far end of the castle grounds to see the tapestry studio, of course we had to walk back up to the castle to see the tapestries again, because we didn’t know what to look for the first time we were in the queen’s bedchamber. So we climbed back up to look more closely. Well worth the walk and the effort, and probably the thing we enjoyed the most at Stirling Castle. A couple of things about this visit: as we were walking up to the castle, we were looking in shops as we went. And I saw someone sitting in one of the shop windows, working on an embroidery in a hoop! Across from her sat another woman winding DMC floss onto bobbins. I wanted so badly to go in the shop and visit for awhile, but we were concerned about our time and catching the train back to Edinburgh so I regretfully passed it up. My husband knows that once I start talking stitching all hope of schedules is gone. And yesterday, I was rewatching Harry Potter and the Half-Blood Prince (one of my favorite series to rewatch as I work), and lo and behold – the unicorn tapestry from Stirling Castle was in one of the background shots! I think the Gryffindor Common Room, but I was so surprised to see it and give it some context! Believe it or not, I found stitching in the Scottish National War Museum at Edinburgh Castle! First of all, there are a LOT of kilts on display! Along with the kilts are jackets, several of which are decorated with some really impressive gold work. Everyone else was looking at the exhibits; I had my face pressed against the glass studying the gold work on the uniforms. There were also other embroidered artifacts on display, and I had to see all of them, of course. On the grounds of Edinburgh Castle is St. Margaret’s Chapel. This is the oldest building in Edinburgh, very tiny, but so beautiful. And of course the thing that caught my attention the most was the beautiful embroidered altar cloth! Unfortunately, I couldn’t get close enough to it to examine it thoroughly, and if I were the rule-breaking type I’d have slipped under the velvet rope guard to look more closely! 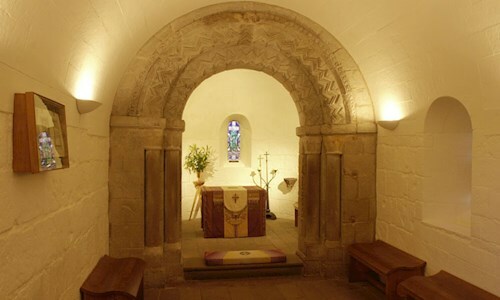 I learned more about St. Margaret’s Chapel when I visited with some Edinburgh friends, and I’ll share that in a later post. We walked from our hotel to the castle, and of course the working textile mill just below the castle caught my attention! So we visited the mill after the castle, went down four flights of stairs to the basement, and saw the looms where they weave the plaids. It was Sunday so the looms weren’t working, but we did get to talk to the attendants and see several examples of woven plaids. Did you know the mill will let you create your own plaid? I was very tempted! It seems that people create all kinds of plaids to celebrate weddings and other events – who knew! I think we walked about 6 miles that day, from the hotel to the castle, up and down all over the castle grounds and the War Museum, then the flights of stairs at the textile mill. I was exhausted! But so glad to have seen so many wonderful textile/embroidery/goldwork things! Well worth the exhaustion and jet lag!